How can I let you be a priority in my life, when I’m still an option in your life? 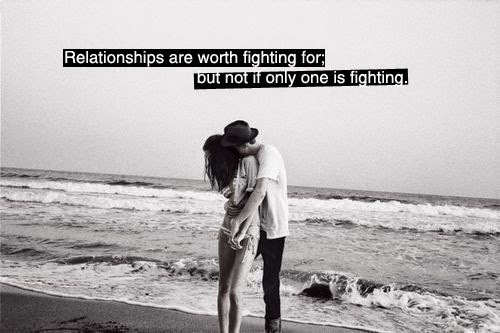 Relationships are worth fighting for; but not if only one is fighting. Because of you I’m scared to fall in love again. This is what happened in love. One of you cried a lot and then both of you grew sarcastic. A bad relationship is like standing on broken glass, if you stay you will keep hurting… If u walk away, you will hurt but eventually u will heal. The true strength of any relationship is measured in bad times not good. Boys are supposed to love & protect their girlfriends, not hurt & betray them. If they don't respect, appreciate, and value you, then they don't deserve you. Relationships are just like a rose, no one can know how long they last. You should deal with your relationships softly. You should not hold them tightly. I mean, if the relationship can't survive the long term, why on earth would it be worth my time and energy for the short term? When you don't talk, there's a lot of stuff that ends up not getting said. Don't stay in a bad relationship because you think it will get better cause it never does. There comes a time in every relationship when you'll realize that love just isn't enough.